Walking around the future construction site, the representatives of the District Department of Transportation (DDOT) including the new director, Jeff Marootian, got a firsthand view of the alleys in which pedestrians, cars, and trucks would mix together in unsafe numbers. The representatives of DDOT listened and were very friendly, but in the end, they stated that alleys are meant to service buildings and not pedestrians. This, in a nutshell, is the District’s Vision Zero problem. When push comes to shove, vehicles are favored over pedestrians, even in alleyways. 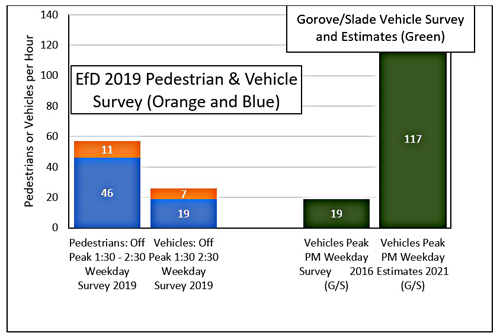 Although DDOT has an active pedestrian and bicycle unit, the regular staff still are not incorporating a mobility focus consistently into their more general work. Recently I have been able to view the reason for this Vision Zero problem through one small window. In my neighborhood, a new mixed-use building is being proposed by Valor Development to be constructed adjacent to the Spring Valley Shopping Center. To its credit, the developer has included some pedestrian amenities in the project. One is a HAWK signal for pedestrians to cross busy Massachusetts Avenue. A second is street sidewalk upgrades. A third is on-site bicycle storage. The problem is that the developer has failed to pay much attention to the safety of pedestrians in the alleyways adjacent to the project on two sides. The alleys that line the site already have both high levels of pedestrian use and high levels of past vehicle accidents. Thankfully, at current speed levels, pedestrians mostly are able to safely navigate through slow-moving vehicles that must negotiate parked cars, trucks and trash bins. Due to the new building, the future will bring both more vehicles and pedestrians into the alleyways surrounding the new building. 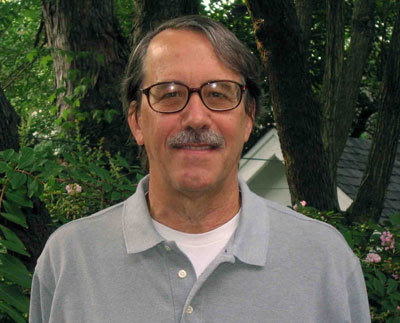 I decided to take a closer look at this pedestrian safety issue and have produced a white paper with the title, “Mobility Issues and Residential Building Design: The Case of the Valor Project in Washington, DC.” For more details, click on the link and read the paper. I provide a summary of the paper below. In the January 2018 plans of the construction firm, there was a pathway through the site called Windom Walk (figure 1). The pathway in that design was flawed, dumping pedestrians right into an area with a loading dock and a parking garage entrance. Although deficient, it had the potential to improve mobility. In a more recent design, the building now goes curb to curb with no pedestrian pathway through the site. They have literally thrown the mobility baby out with the bathwater. Pedestrians from the neighborhood and the building will use the alleys as the shortest route to Spring Valley Shopping Center and to the future HAWK signal on Massachusetts Avenue. This future HAWK signal will connect pedestrians to retail shops on both sides of Mass. Avenue. 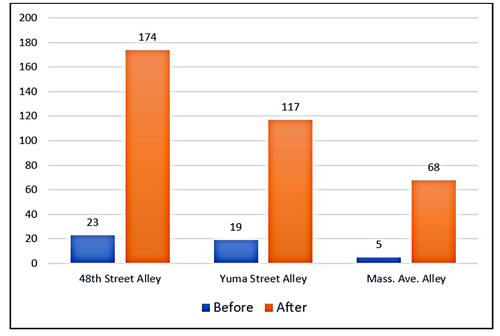 The number of vehicles in the alleyways before and afer the project will increase significantly (figure 2). The before and after figures are for vehicles per hour between 4 and 6 PM. Also, the before levels are based on a vehicle survey conducted by Gorove/Slade (2017). The after figures are estimates for 5 years later upon the completion of the building. The vehicles passing through the Yuma Street and alley intersection will increase from 19 vehicles to 117 before and after the project. The vehicle entrances and exits at the 48th Street alley intersection are 23 and 174 before and after the project. This increases alley traffic volume by more than 6 times, making them more like low volume city streets. According to a survey I conducted recently (Barnes 2019), the north-south alley is already heavily used by pedestrians at 57 per hour (figure 3). This pedestrian traffic will increase significantly after the new construction. The figures estimated by the traffic consultants Gorove/Slade indicate that the number of cars and trucks per hour coming into this same alley will increase from 19 to 117. In the future the alleys will carry both high levels of pedestrians and vehicles. Added to this mix of vehicles and pedestrians are sidewalks that are inadequate. The sidewalks planned along the north-south alley are only 3 feet wide, bumping up against a vertical wall (figure 4). The existing alley is on the left of figure 4 and the new building walls and sidewalk are sketched in on the right side. Clearly, this will squeeze pedestrians and vehicles into a narrow space. The planned widening the the alley sounds at first to be a good idea, but without separating pedestrians from traffic this will increase speeds and create saftey issues. The counterintuitive alternative is to keep the alley narrow with obstacles. This will thin and slow down the traffic, making the alley space more walkable. The proposed sidewalks are well below the levels recommended by the Federal Highway Administration (FHWA) for streets. According the FHWA (2013) "Sidewalks require a minimum width of 5.0 feet if set back from the curb or 6.0 feet if at the curb face. Any width less than this does not meet the minimum requirements for people with disabilities." The rub is that this requirement is for city streets and not for alleyways, even if such alleys have high volumes of traffic. From a mobility point of view, the new building will turn alleyways into low volume city streets. This creates a loophole so that the construction company does not have meet accepted sidewalk codes. With trash pickup bins along a narrow alley, this arrangement will be pedestrian unfriendly and will likely lead to even more accidents in an already high accident-prone alleyway. 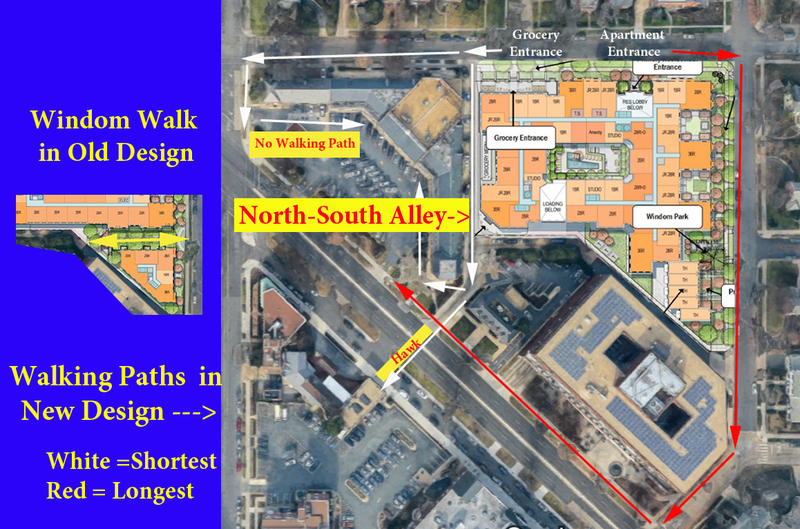 Alleys can be made safe as evidenced by the 7-foot alley sidewalk leading to Whole Foods in nearby Tenleytown (figure 5). In its desire to maximize building density, the construction company has no private driveways or walkways through the building site. Instead, they use public streets and alleyways to service the residential building and the grocery store. The result is that it creates public mobility safety issues that contradict DC Government’s commitment to Vision Zero. Ironically, the response of DDOT and the construction company to public safety concerns seems to be--these are just alleys. This is a once in a lifetime building. As a consequence, it is a unique opportunity to provide mobility incentives rather than disincentives. The building should be more neighborhood friendly and contain better public realm amenities. It should encourage pedestrian mobility rather than treating walkers as poor cousins to cars and trucks. Barnes, Douglas. 2019. Mobility Issues and Residential Apartment Building Design: The Case of the Valor Project in Washington, DC. White Paper No. 2, Energy for Development, Washington, DC. District of Columbia. 2017. Vision Zero: Safe Streets for Washington, DC 2016 Progress Report. Report for the Mayor, District of Columbia, Washington, DC. (FHWA) Federal Highway Administration. 2013 FHWA Course on Bicycle and Pedestrian Transportation. Publication No. FHWA-RD-99-198, A Report to the Federal Highway Administration, Washington, DC. Gorove/Slade, 2018. “The Ladybird CTR Supplemental Transportation Information.” Memo to DC Zoning Commission, Washington, DC, November 23. __________ 2017. “Comprehensive Transportation Plan: The Ladybird, Washington, DC.” Report Prepared for Valor Construction and the DC Zoning Commission, Washington, DC, November. Washington Post Editorial. 2018. “Too many people died in D.C. traffic crashes in 2018. We can do better in 2019.” Washington Post, January 31, 2018.